Trigger Pull: The trigger pull on the Daisy Powerline Model 617X CO2 Pellet-BB Pistol is pretty decent on both single and double action, single action of course being shorter and lighter. I even found when adding the 6 shot rotary magazine, this did not affect the trigger pull at all. I would not say the trigger pull is light, but it is not heavy either and the release or breaking point is very predictable which should make the Daisy Powerline Model 617X a pretty good shooter in theory. Build Quality: The Daisy Powerline Model 617X CO2 Pellet-BB Pistol is made in Japan which is known for producing quality products in general. I would have to say by giving the Powerline 617X a good look over that it appears to be well made with good fit and finish even though most of the gun is plastic on the outside. The metal parts are where they need to be, lots internally in structural areas and externally as in the trigger, hammer, safety, and of course the internal metal rifled barrel. 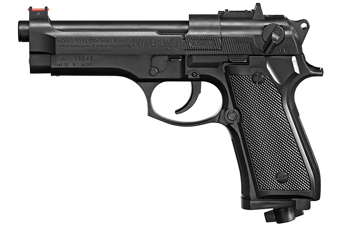 Realism: The Daisy Powerline Model 617X CO2 Pellet-BB Pistol is a replica of a Beretta Model 92 even though there are no Beretta markings on the gun. Some of the parts are moulded in like the take down lever, slide catch release and magazine release but on the plus side the ambidextrous safety is in the correct location, working and metal. The internal metal frame give the Daisy Model 617X enough weight to feel good in the hand but is much lighter than a real solid steel Beretta 92. Size is comparable and other than the sticking out CO2 tab this gun does look like a Beretta 92 until you get up close and personal. Red fiber-optic front sight makes it easy to line up targets in different light situations. Comments: I have heard that this Daisy pistol shoots steel 4.5mm BB's at right up around the 500 fps range so even lead pellets should have good velocity out of the Daisy Powerline Model 617X CO2 Pellet-BB Pistol. The single action trigger has a nice medium pull with a very predictable break so as long as the sights are centered on target well, I should expect a nice grouping. If you like the Beretta style of gun, don't want to spend an arm and a leg on a pellet shooting version, than the Daisy Powerline Model 617X CO2 Pellet-BB Pistol should work well for you. 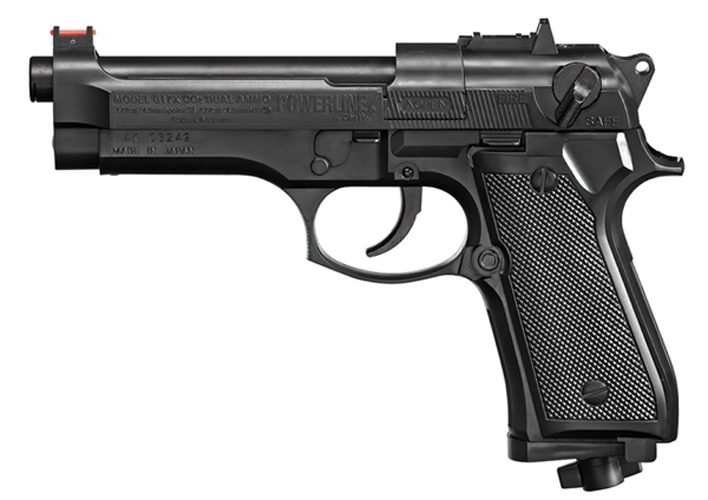 http://www.ReplicaAirguns.com - Daisy Powerline Model 617X (Beretta 92) CO2 Pellet-BB Pistol Table Top Review.